However, closer inspection reveals that the Balance 451’s commitment to performance is much more than skin deep. Although nearly 4ft longer than her predecessor and close cousin, the Balance 421, the 451 comes in at roughly the same displacement, thanks to the fact that not only are her hulls and deck foam cored, but her bulkheads, floors, hardtop bimini, cabinetry and even her dining tables are cored as well. This light weight translates into speed without having to resort to a massive, hard-to-handle sailplan. Vinylester resins are infused throughout the deck and hulls, with carbon fiber in high-load areas, like the stringers and bulkheads, to ensure the stiffest, most durable structure possible at a competitive price point. 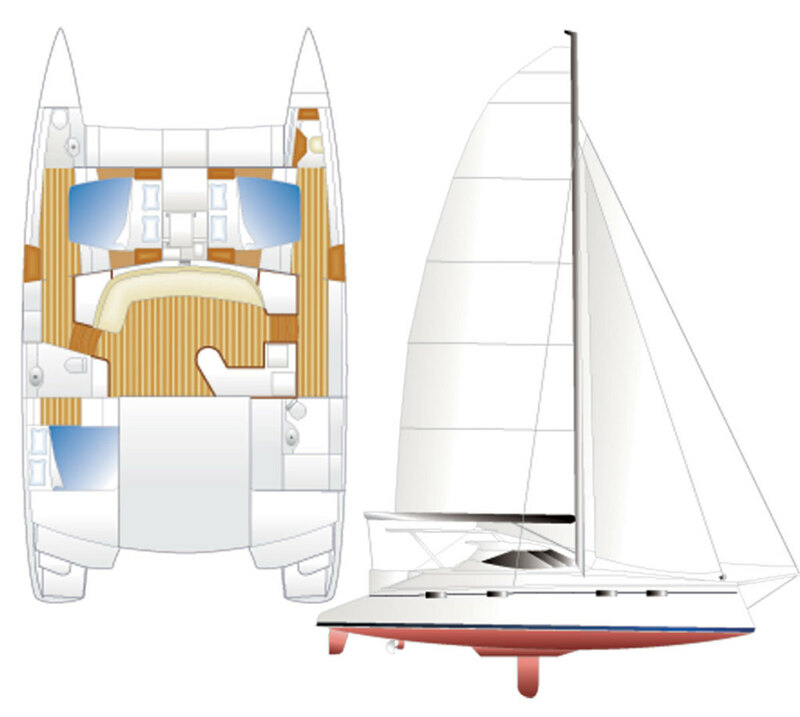 In the interest of windward performance, the Balance 451 comes equipped with a pair of daggerboards and two shallow stub keels to protect the boat’s rudders and saildrives. The boat’s Seldén mast has been kept under 65ft to ensure adequate fixed-bridge clearance on the ICW. It has also been deliberately specified with a thicker extrusion so that a single spreader is enough to keep it upright, in the interest of simplifying the rigging and minimizing the numbers of wire terminals necessary. 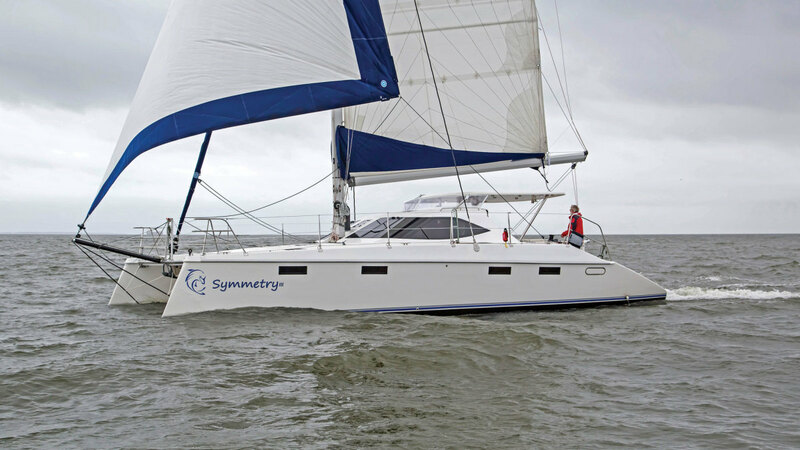 According to Multihull Company founder Phil Berman, the U.S. distributor for Balance, the thinking here was to not only make the rig safer by reducing the number of potential failure points, but also make it easier to change out the shrouds years down the road—a prime example of some of the sensible thinking that went into the design and construction of this boat. On deck, the boat is in many ways remarkable for what it lacks, i.e., those vast wide-open lounging spaces found aboard more charter-orientated catamarans. Indeed, with its curved cockpit seats, the aft portion of the boat even looks a little “retro.” However, it doesn’t take long to figure out that this is, in fact, another example of a carefully “balanced” space, in which there is a place for everything, and everything has its place. The folding cockpit table and benches, for instance, have been fabricated in a series of irregularly curved shapes that not only provide space for a crowd, but are easy to slip into and out of. The helm station seat is both protected from the weather by the bimini and fully adjustable. Four-corner visibility makes docking a breeze, and our test boat came with a Lewmar electric winch for hoisting the main. The standard navigation package is from Raymarine. Forward, there is a pair of massive storage lockers, which have a baffled channel to the accommodations allowing them to double as wind scoops. They also include a pair of fuel-transfer hoses, making them an ideal place to hide away jerry cans or bladders if you plan on doing a lot of motoring—two more examples of the many smart, forward-thinking details that have gone into this design. 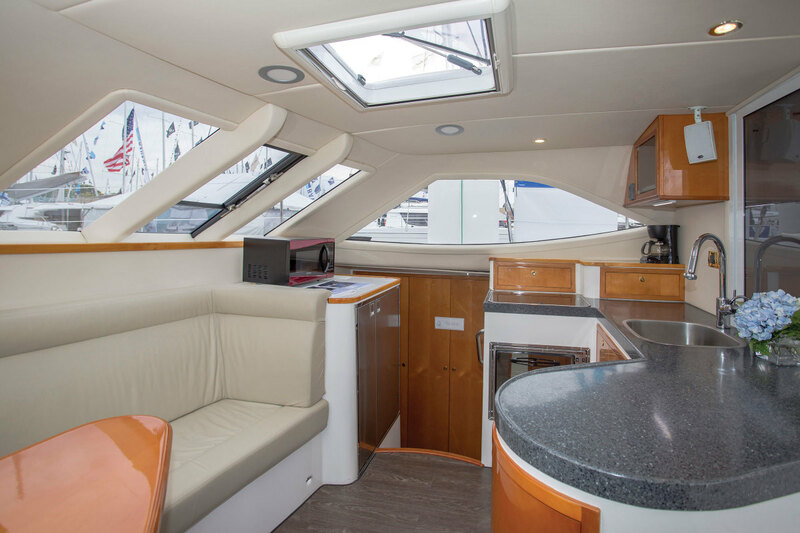 Although it lacks the vast amounts of interior space found aboard many of today’s cruising cats, the Balance 451 more than makes up for it with the same kind of smart design found topsides. This is especially evident in the saloon, which features another asymmetrical table with a fold-town “tip,” where the long, curved seat faces the galley. Maybe it’s because I’m over 6ft, but I have a heck of a time squeezing in behind the huge rectangular tables found on many cats (and monohulls for that matter). Aboard the Balance 451, however, those problems simply go away, especially with the tip down. The open space between it and the galley, which includes a SMEV stove and Isotherm fridge, makes it easy to shuttle plates and cups back and forth, and a pair of single seats allow guests to sit along the aft edge. There are also no sharp corners to bump up against anywhere. These may seem like little things to the uninitiated, but they make all the difference in the world when, say, fumbling about at night in a bumpy seaway. The private living spaces are designed to accommodate a pair of large, mirror image athwartship bunks forward with access from both sides and another pair of large athwardships bunks aft. However, this basic space is easily customized, and on our test boat, the entire port hull was given over to the owner, with the bunk aft converted into an office. (The starboard hull can be given over to the owner as well.) Showers and heads can also be added or subtracted at will, and the owner’s shower/head arrangement aboard the test boat was absolutely spectacular for a boat this size. Again ventilation is great, and each cabin has at least one hull window and a large overhead hatch to bring in plenty of ambient light. A smattering of optional cherry trim on our test boat kept the overall effect warm and inviting. Proportions throughout, whether they be steps, seat heights or passageway widths, all work well. Hill is clearly a naval architect who knows the devil is in the details. It was chilly, overcast and blowing 20 knots-plus the afternoon of our sail trial—perfect conditions for a boat like the Balance 451. Better still, the wind was out of the northeast, building up a nice chop to be sliced open by those wave-piercing bows. The result—a hell of a sail. Tacking the boat was simplicity itself thanks to the self-tacking headsail—which, like the full-batten main, was built by Neil Pryde—even when I mistimed the waves bringing water over the bow. There’s nothing more disappointing than a boat that doesn’t pass through stays with confidence, and nothing better than a boat that does. The Balance 451 does not disappoint. On course, the Balance 451 is one of those cats that has the feel of a monohull—albeit a monohull that slices through the chop with the kind of efficiency monohulls can only dream about. In 16 knots of wind gusting to 18 knots we easily hit 9 knots and more on a broad reach. Hardening up to a 60-degree true wind angle we held a steady 9.6 knots, even as the boat’s easy motion remained deceptively smooth in the growing swells. A carbon bowsprit for flying reaching sails is available as an option. This is a boat that will click off some serious 24-hour runs on passage. Alas, we totally mistimed the drawbridge opening on our way back to the marina. However, that also meant I had a good 15 minutes to play with our test boat’s optional twin 40hp Volvo Pentas and saildrives (twin 29hp diesels are standard) to keep from getting blown ashore or into the swarm of powerboats around us as we waited. I also threw in any number of turns and backups, with the 15-plus-knot inshore breeze fighting me all the while. The boat, which turns a pair of three-blade Volvo folding props, did great and I could put it in any spot and at any angle to the wind with ease. Life at the extremes, especially if you’ve got money to burn, is an easy one, because your priorities are tightly focused. A good middle ground, however, can be much tougher to find and hold, because you’ve got a number of different priorities in play. The solution inevitably calls for a kind of balance, something this boat has in abundance.